So I recently learnt how to use Blender, and I thought that I could show off some off the renders I made. To start this off, I wondered what the Mario series characters would do in different situations. 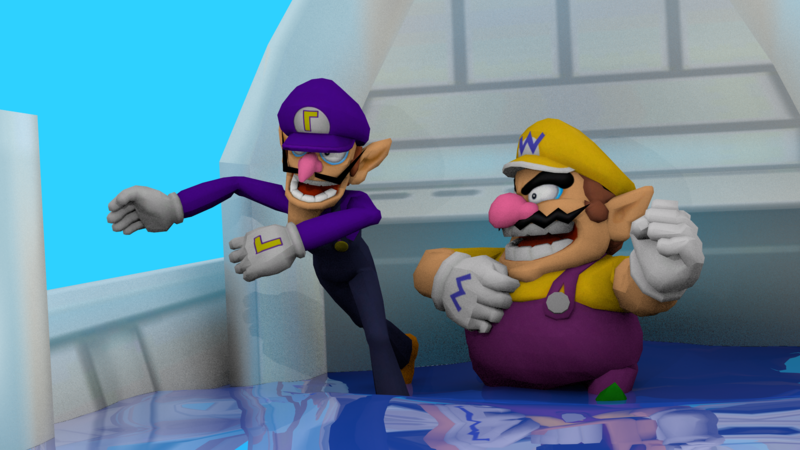 To start, I put Wario and Waluigi into a sinking ship. Maybe they would try and bail out the water using a sponge? Nope. They would goof around. The graininess can be an issue, but that comes at the benefit of a lot of good things. If I turned off the setting that produces grain, it would look awful. Any shadow or shading would be completely black. I'm up for creating renders for anyone who asks. Of course, if it isn't something that is in a video game, I can try my best. I can also do 2D stuff if I'm up to it. I can take requests if anyone wants. Feel free to post any questions below. 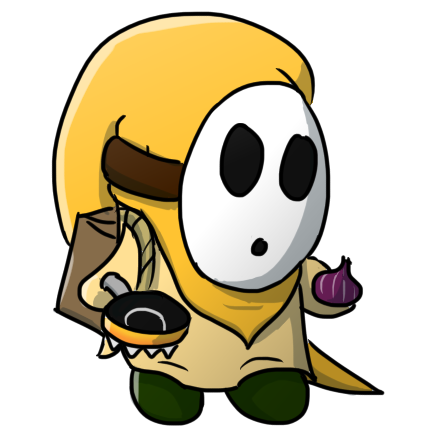 This is my thread for posting anything I've drawn or rendered, and 'Shroom stuff when needed. I don't really need another Fan Creations thread just for shilling Cooking Guide. I'll probably have other stuff here, so expect some **wacky** posts. Uh, is it one of the miis? If so, please send a picture. Okay, I'll work on that then. 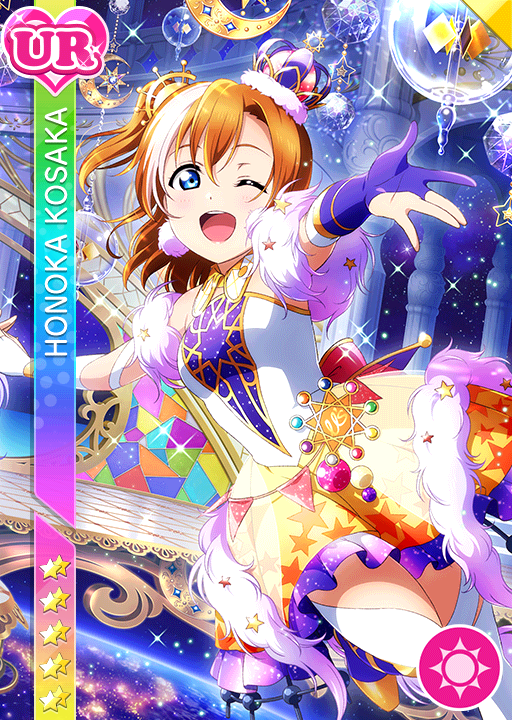 [EDITX2 COMBO] I fixed it a little- the arms were twisted all weird. 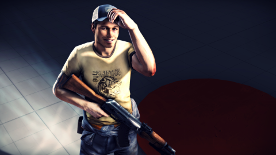 Rather than angled I think his arm should be straighter. Yes I know I'm horrible at diagrams but I think you know what I'm going for. 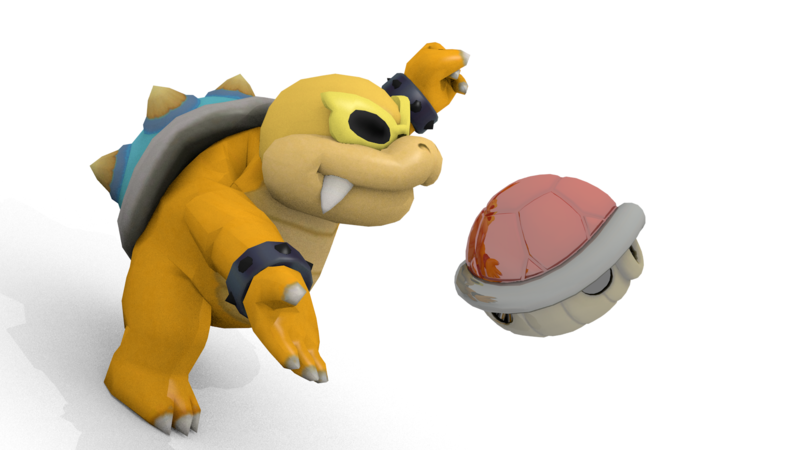 Next, instead of way out in the air, I was thinking the shell could be directly above his hand. Again they're not the best but oh well, like how I used a capital O because there's really no other key on my keyboard that would represent a shell. Good job on actually doing them though. They look really nice. Is this more like what you wanted? This one was a little tough, as the helmet is completely transparent and without light or shade, etc. But it's Pikmin, so I hope you like it! 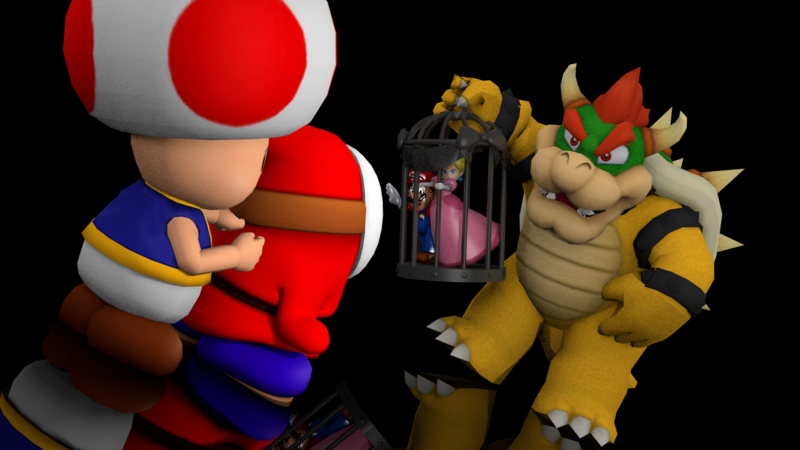 Can you do Toad and Shy Guy confronting Bowser with Mario and Peach in a cage? Quick question, what is the "hero mode art" referring to? Hero mode is an art style used in a webcomic called Homestuck, in which the protagonists are depicted in blocks of colour, and normally in .gif format. 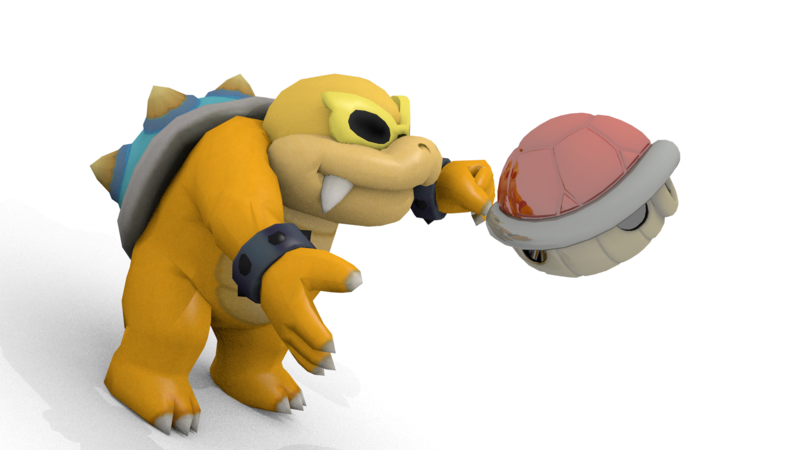 The Shy Guy-Toad X Bowser + Mario & Peach showdown render is here! The cool mirror floor was actually quite fun. Enjoy! 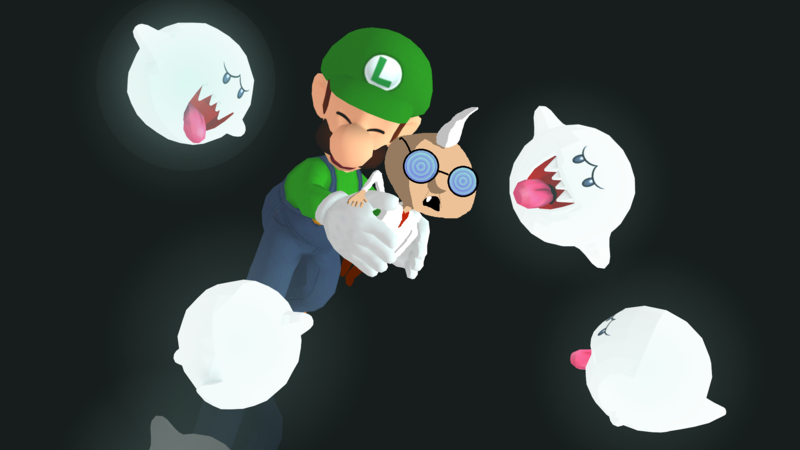 how about Luigi and E. Gadd surrounded by Boos? 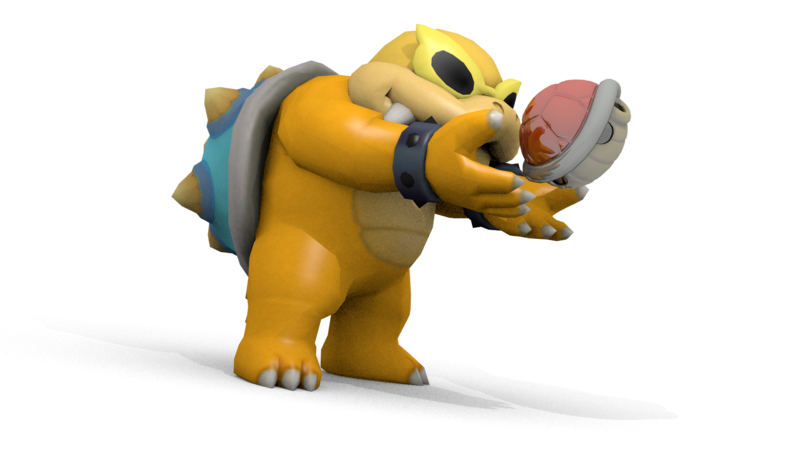 I couldn't find a decent model of E. Gadd, so I went for Hero Mode E. Gadd instead. 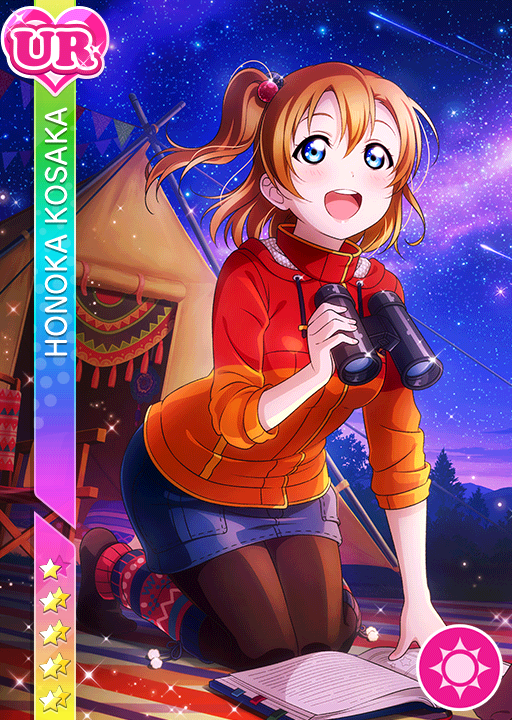 I think the combo of 2D and 3D works well, in my opinion. 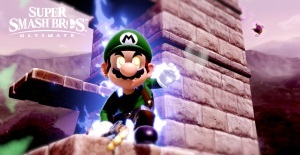 Are Luigi's fingers rigged? Because they look kind of flat to me. There's two bones for the fingers (they're a single object), and two bones for the thumb. I've noticed that the quality of MK8's riggings are not very good around the hands and feet, but I can still work with them. 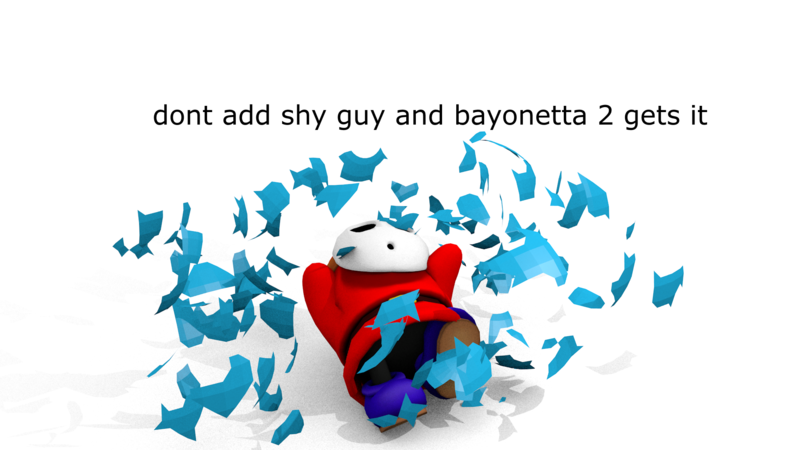 Also, for anyone who saw my fit on Bayonetta, I decided to visualise my opinion. In case you didn't notice, I don't like Bayonetta. I suggest you use another model for the rig then. Fingers are pretty important when it comes to posing. 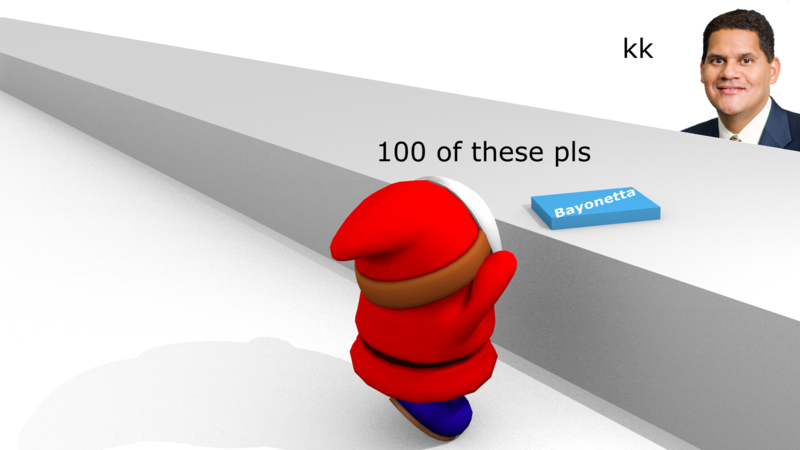 Bayonetta's like my pet hate, but I appreciate the work Nintendo've put into her at such small notice.